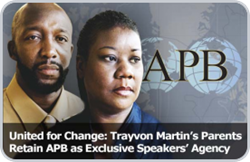 American Program Bureau (APB) is proud to be named the exclusive speaking agency for Sybrina Fulton and Tracy Martin, the parents of Trayvon Martin. Since the death of their son, Fulton and Martin have committed their lives to transforming tragedy into change, working to ensure the survival of every child through education and thoughtful conversations about conflict resolution. Through their inspiring and thought provoking presentations, Fulton and Martin are hoping to encourage the positive changes that can help keep every family safe. The publicity surrounding Trayvon’s death and the ensuing trial catapulted the country into national debate. Facing increasing demands to speak publicly, Fulton and Martin are retaining the services of APB to schedule and manage their speaking engagements. Both Fulton and Martin are available to speak individually, or as a combined program. In addition, the couple’s legal team of Benjamin Crump and Daryl Parks also are available to accompany Fulton and Martin – or can appear individually – pending schedule availability. A Miami native, Sybrina Fulton has become an inspiring spokesperson for parents and concerned citizens across the country, lending her voice to speak against violence towards children and the need to build safer communities. An honest and relatable speaker, her message not only appeals to people’s hearts, but is also one of hope and change, exemplified by her personal experiences and endeavors. As a mother, she inspires audiences to continuously educate their children about civil rights and to help them feel accepted as part of an ever changing society. Much like Fulton, Tracy Martin has taken his role as proud parent and channeled his efforts to promote the broad societal shift required to ensure that a similar incident never claims the life of another child. Martin’s message of change extends to families from all walks of life, encouraging parents, relatives, caregivers and teachers to let their sons, daughters, and other loved ones know that their lives are valuable and to stress that they are loved no matter how society views them. Although his son is gone, Martin hopes Trayvon’s death helps to heal the country and acts as motivation for parents and caregivers to keep fighting for the safety of all children. American Program Bureau is honored to manage and host these honest and influential conversations, which can be customized to meet the needs of diverse audiences from colleges and legal professionals to community and business organizations. Through their inspiring and thought provoking presentations, Fulton and Martin are hoping to encourage the positive changes that can help keep every family safe. Organizations wishing to book Fulton and Martin should contact American Program Bureau at 1-617-614-1600 for information on available dates and program topics. For more information on American Program Bureau, please visit http://www.apbspeakers.com. For a profile on Sybrina Fulton, please visit http://www.apbspeakers.com/speaker/sybrina-fulton. For a profile on Tracy Martin, please visit http://www.apbspeakers.com/speaker/Tracy-Martin. Throughout its 50 year history, American Program Bureau has provided a platform for the world’s foremost speakers on civil liberties and social justice. Beginning life as the first collegiate programming agency, APB has long represented the pantheon of civil liberties activists including Dr. Martin Luther King, Jr., Julian Bond, Jesse Jackson, Michael Eric Dyson, Clarence Jones and others. Today, APB stands as the leader in the professional speaking industry, representing hundreds of speakers and serving thousands of clients worldwide. APB speakers delineate the pinnacle of inspiring voices in the areas of business, technology, science, health and entertainment, including Mikhail Gorbachev, Archbishop Desmond Tutu, Dan Rather, Michael Douglas and many others.